Plant: perennial herb, sprawling, decumbent, with branches generally radiating from a central woody underground stem, the branches to 1 m long, green, densely tomentose to sparsely strigose Leaves: 5-25 mm long, 0.9-4 mm wide, variably strigose, alternate, exstipulate INFLORESCENCE: uniflorous in leaf axils, racemes Flowers: flowering stalks 1-3 cm long; bractlets (7-)10-15 mm long, 0.5-2 mm wide, distal on the flowering stalk; sepals 5, spreading, densely strigose on the outer surfaces, deep purple; lowermost sepal 10-16 mm long, 3-6 mm wide; elaiophores cuneate, 1.5-3 mm long, pink, apricot-colored, or reddish with secretory blisters restricted to the upper half or quarter of the outer and distal faces; petaloid petals 3, clawed, 5-7 mm long, basally connate for about 4 mm with the connate portion cream-colored or pink, the terminal, distinct portions expanded into reniform blades, these crenulate, 1.5-2 mm long, 2-3 mm wide, purple, or pink and purple-edged; stamens 4, 3-4 mm long, inserted on the connate base of the petaloid petals with lateral pair connate for 1-2.5 mm beyond the point of insertion, pale pink; ovary 3-4 mm long; style pink Fruit: FRUITS globose (rarely slightly cordate) in outline, 5.5-8 mm wide excluding spines, variously pubescent, bearing stout, scattered spines; individual spines yellow, 1.8-5.3 mm long appearing roughened at the distal ends; SEEDS globose, gray-brown, smooth, lacking endosperm Misc: Usually in open grassy habitats with oak, or oak and pine; 1200-1700 m (4000-5500 ft.); May-Aug REFERENCES: Simpson, Beryl B. Andrew Salywon. 1999. 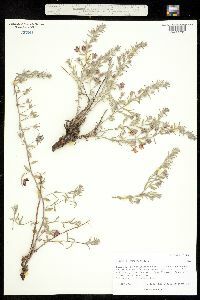 Krameriaceae. Ariz. - Nev. Acad. Sci. 32(1).